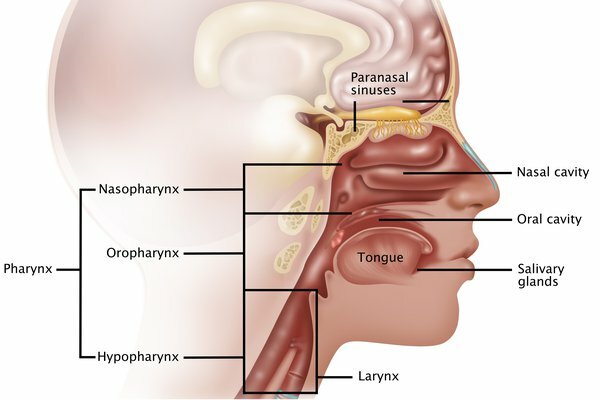 Nasopharyngeal cancer is a rare type of cancer that affects the part of the throat connecting the back of the nose to the back of the mouth (the pharynx). In the UK, about 250 people are diagnosed with nasopharyngeal cancer each year. Nasopharyngeal cancer shouldn't be confused with other types of cancer that also affect the throat, such as laryngeal cancer and oesophageal cancer. It's often difficult to recognise nasopharyngeal cancer because the symptoms are similar to other, less serious conditions. Also, many people with nasopharyngeal cancer don't have any symptoms until the cancer reaches an advanced stage. See your GP if you develop any worrying symptoms, particularly if they don't improve after a few weeks. It's very unlikely they'll be caused by nasopharyngeal cancer, but it's best to get them checked out. The exact cause of nasopharyngeal cancer is unknown, but a number of factors can increase your risk of developing the condition. Being exposed to the human papilloma virus (HPV) may also increase your risk of developing certain types of nasopharyngeal cancer. About 3 times as many men as women are affected by nasopharyngeal cancer, and the average age at diagnosis is about 50. If you see your GP with symptoms that could indicate nasopharyngeal cancer, they'll usually ask about your symptoms and carry out some examinations. This may involve examining your throat using a small mirror and a light. Your GP will refer you to a head and neck cancer specialist (oncologist) if they think further tests are necessary. At hospital, a number of different tests may be carried out to check for nasopharyngeal cancer and rule out other conditions. Once these tests are complete, your doctors will be able to confirm whether you have nasopharyngeal cancer. They'll also be able to "stage" the cancer, which means giving it a score to describe how large it is and how far it's spread. The Cancer Research UK website has more information about the stages of nasopharyngeal cancer. If you're diagnosed with nasopharyngeal cancer, you'll be cared for by a team of different specialists who work together called a multidisciplinary team (MDT). Members of your MDT will discuss with you what they think the best treatment option is in your case. In most cases, a combination of radiotherapy and chemotherapy will be used. Surgery isn't usually used to treat nasopharyngeal cancer because it's difficult for surgeons to access the affected area. If you smoke, it's important you give up. Smoking increases your risk of cancer returning and may cause more side effects from treatment. Radiotherapy is the most commonly used treatment for nasopharyngeal cancer. It can be used on its own to treat very early-stage cancers, or in combination with chemotherapy for more advanced cancers. In most cases, external radiotherapy is used. It involves using a machine to focus high-energy radiation beams on to the area that requires treatment. In nasopharyngeal cancer, an advanced form of external radiotherapy called intensity-modulated radiation therapy (IMRT) is used. It involves aiming radiation beams of different strengths at a tumour from several different angles. This helps maximise the dose delivered to the tumour, while minimising the effect on the surrounding healthy tissue. Stereotactic radiotherapy is another way of giving radiotherapy externally and may be used to target a specific area where the cancer has returned. External radiotherapy is often given in short sessions, once a day from Monday to Friday, with a break at weekends. This is usually carried out for up to 7 weeks. You won't need to stay in hospital overnight between these appointments. In some cases, internal radiotherapy may be required where nasopharyngeal cancer has returned after initial treatment. A radioactive source is placed into or near the cancerous area and left in place for anywhere from a few minutes to a few days. Depending on the type of treatment you have, you may need to stay in hospital for a short period of time. These side effects are usually temporary, but some can be permanent. Let your care team know if you experience these problems as treatment is often available to help. Read more about what happens during radiotherapy and the side effects of radiotherapy. Chemotherapy may be used before or alongside radiotherapy for more advanced nasopharyngeal cancers. It's usually given through a drip into a vein (intravenous chemotherapy), with sessions every 3 to 4 weeks spread over several months. You won't usually need to stay in hospital overnight during treatment. These side effects are usually temporary, but there's also a risk of longer term problems, such as infertility. You should discuss any concerns you have about the potential side effects of treatment with your care team before treatment begins. Read more about what happens during chemotherapy and the side effects of chemotherapy. After your course of treatment ends, you'll need to have regular follow-up appointments and scans to monitor your recovery and check for any signs of the cancer returning. To start with, these appointments will be every few weeks or months, but they'll become gradually less frequent over time. The outlook for nasopharyngeal cancer depends on your age, general health and how advanced the condition is when you're diagnosed. Radiotherapy can often cure very early-stage nasopharyngeal cancer, but the condition is sometimes diagnosed at a more advanced stage because it doesn't always cause obvious symptoms until later on. More advanced cancers are treated with a combination of chemotherapy and radiotherapy. They're often curable if the cancer hasn't spread beyond the head and neck region. There aren't any UK survival statistics for nasopharyngeal cancer. In England, almost 80 out of every 100 people diagnosed with nasopharyngeal cancer will live for at least 1 year after diagnosis. About 50 people out of 100 will live for 5 years or more after being diagnosed. The Cancer Research UK website has more survival statistics for nasopharyngeal cancer. You can read more about nasopharyngeal cancer on the Cancer Research UK website. Macmillan Cancer Support is another good source of information and advice about nasopharyngeal cancer.